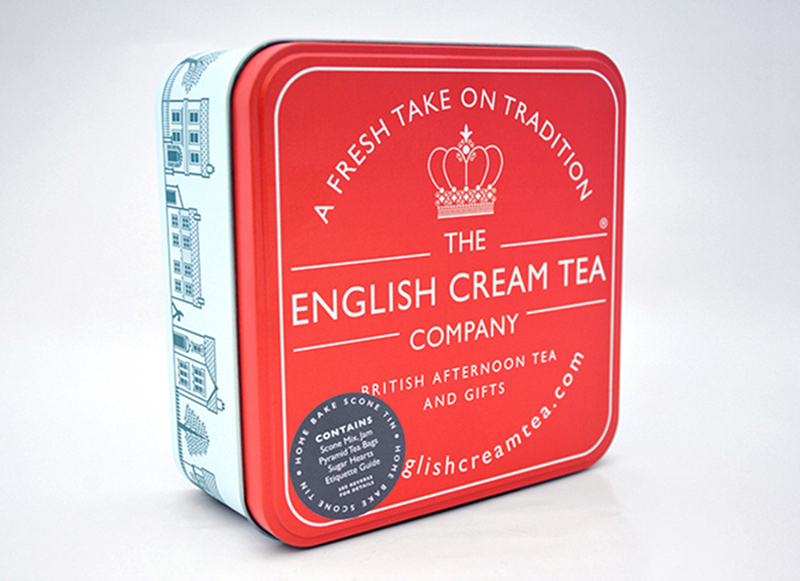 A charming gift and a great cupboard standby for guests calling in at tea time! Contains luxury Jam, Tea, Sugar Hearts, a tin of Afternoon Tea pyramid teabags + our delicious English Cream Tea Company Scone Mix! Easily make 4-5 large, light Scones with our tasty Scone Mix bag. Just use a wooden spoon and mixing bowl + add 2 eggs and a spoonful of melted butter (or oil if you want to avoid dairy). From start to finish if you have a pre-heated oven, it takes 16 minutes (so get that kettle on quick for your tea). The Tin doesn't come with cream as that's perishable but this lovely gift does come with our Manners Tips booklet and guide on how to make a perfect cuppa! Tell us the date you want it posted out and we'll send it with your gift message too if you wish. Price includes UK post. Please note that the scone mix does contain wheatflour - and therefore the allergen: gluten. It does not contain dairy. ANY DIFFICULTIES processing your order, just ring us on 01279 876661 and we'll help out on the phone - or pop an email to us. AFTERNOON TEA WITH A HINT OF CITRUS 5 PYRAMID TEA BAGS 12g : A blend of black teas: Borengajuli (Assam black tea), Kosabei (Kenya black tea), Lime Leaves, Lemongrass and Lemon Verbena. ENGLISH SUGAR HEARTS: Sugar, glucose syrup, water, thickener (E1422), colour E129, preservative (acetic acid). This product is Nut free, Gluten Free, Dairy free, Egg Free, GM Free and suitable for Vegans STRAWBERRY JAM WITH A HINT OF ELDERFLOWER: Sugar, Strawberries (45%), Elderflower (<3%), Gelling Agent: Pectin, Citric Acid. Total fruit content 45g per 100g. Total sugar 65g per 100g. May contain traces nuts. No artificial flavouring, colouring or preservative. Gluten free.